I love drinking water! That is, clean, good tasting water. We’ve had a Brita filter for years. And everyday – multiple times a day – I have to refill it. Having a water system hooked up to our sink was a dream for us because we wanted a “good” one if were going to splurge to buy one. As you probably understand, I was more than excited when Zuvo water wanted me to review their system! With all the concern about unsafe chemicals in our tap water, Moms are concerned about finding solutions to this important problem; especially when it comes to making formula, for cooking and hydrating ourselves and our kids. The new Zuvo Water Filtration System delivers cleaner and healthier water direct from your tap that leaves no carbon footprint. It’s all recyclable too. The Zuvo is telegenic and amazing to watch, you see your tap water bubbling in a blue UV light and getting cleaner before your eyes. Now just in time for the holidays Zuvo Water is introducing its new Zuvo 150 Water Filtration System. 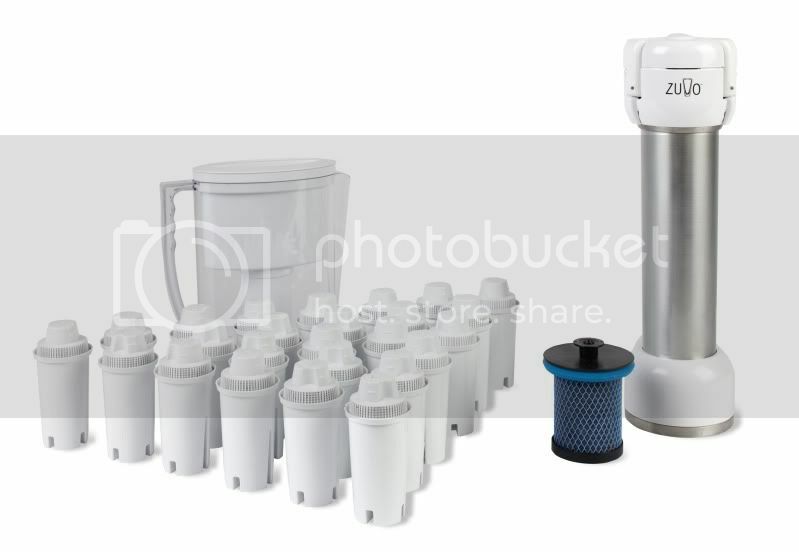 Priced at less than $150 a fraction of other automated water filtration systems this is the low-cost high-volume easy to install home water filtration system that everyone has been waiting for! It’s elegantly designed, high tech and easy to use. Tap water safety is a number one concern for our health and fitness. This year, the President’s Anti-Cancer Panel specifically recommended home water filtration for tap water. The Zuvo Water Filtration System makes tap water safer and more delicious for the whole family to drinkâ€¦ and, unlike pitcher water systems, offers UNLIMITED fresh water! Now the entire family can enjoy all the clean fresh water they want all year round. Zuvo’s UV/Ozone filtration system reproduces nature’s photo-oxidation cleansing process, filtering impurities and reduces microorganisms, while preserving your water’s natural and healthy mineral content and adding fresh oxygen, giving it a delicious taste. That makes users choose Zuvo over ordinary tap or bottled water every time! Hubby easily hooked ours up. We rent so ours had to stay on top the counter (something about screws and holes, Hubby tried to explain to me, if it was to go underneath) which ended up being okay because now we get to watch it work! 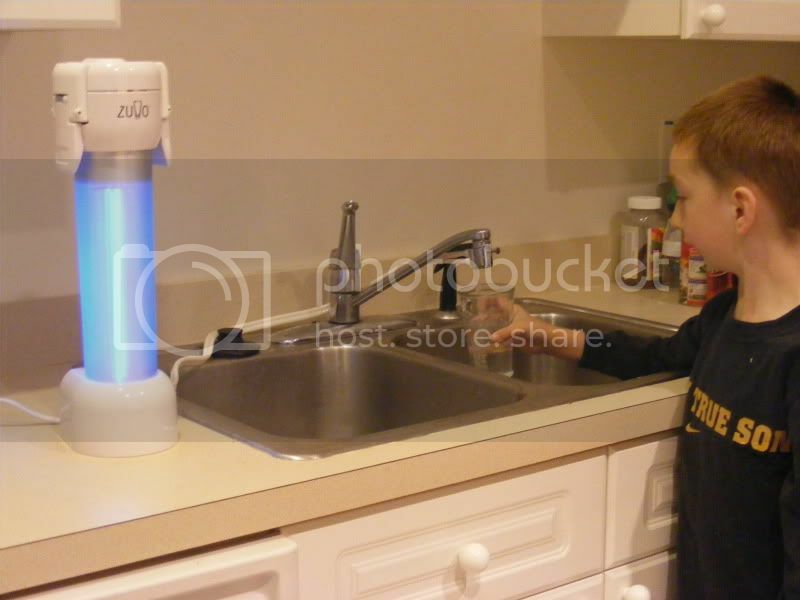 The Zuvo turns a bright blue as it filters the water to the faucet. And here it is when you easily pull the switch at the faucet.. Cool huh?! I love how easy it is for the kids to use. They love it too! I knew I was doing my part in helping the environment by not using plastic bottles but FILTERS? It didn’t even cross my mind. So the bottom line is…you need a Zuvo too!! 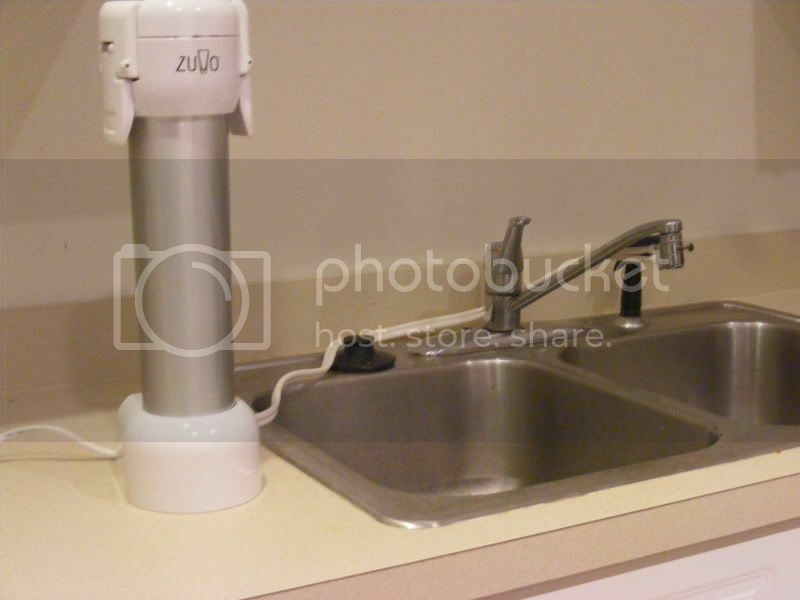 WIN a Zuvo Water Filitration System! Zuvo Water sent me a water filtration system for this review but I was not compensated in any way for the post and all opinions are my own. I think I posted my comment on the wrong post. I would feel more comfortable drinking our tap water when using a good quality filter. Fb friend and email subscriber. I Would love to have one of these bc we are a family of five and we drink a lot of filtered water. Straight out of the tap would be so convenient for us! Especially for all the baby bottles we have to make!!! I would love to have this beacause our city water is disgusting. It tastes and smells awful. And we drink a lot of water. I follow on GFC. I need to win because there is something in the water here that I'm allergic to. I'm using the Brita pitcher now. I entered giveaway on Eco friendly's blog. I entered the Zuvo giveaway at Eco-Friendly & Frugal's blog. i need one because we drink so much water we go through pur filters like every other week and its wicked expensive! I entered the giveaway at EcoFriendlyandFrugal. Thanks! I have thought about the filters being thrown away, this would be a great alternative. I NEED one of these because pretty much all we drink in my household is water. Juice is a rare treat, and soda - NEVER. I go through way too much water to buy it by the gallon, so right now I have a Brita pitcher. I would LOVE, LOVE to have the Zuvo as an alternative. I am SO SICK of buying those expensive Brita filters constantly! 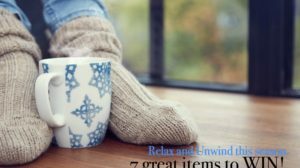 Entering Eco-Friendly & Frugal's giveaway! I follow publicly via Google Friend Connect!mom2_3boyzz at yahoo dot comWe could really use this in our house because we have a family of 6 and go through LOTS of water bottles weekly! our water tastes horrible!! also, GFC follower and like you on FB! i know ive shared this before, but one of the things i really need to work on is my consumption of BOTTLED water! eck! i'd love to have this fancy pantsy water filtration system. I follow you publicly via GFC. As for why we need it: we spent a LOT of money getting a well drilled only to have it so we can't drink the tap water. Bottled water is becoming really expensive. We need a good filter system. Thanks for the shot at winning. Thanks for the giveaway...would like to try out the Zuvo Water Filtration System because our tap water has some recurrent "issues": it can sometimes look a bit cloudy & have a strong chlorine aftertaste !senorpiero [at] yahoo [dot] comGFC Follower: Brian E.
Follow Zuvo on Facebook: bryan easonsenorpiero [at] yahoo [dot] comGFC Follower: Brian E.
Following you via Twitter: @brianpieroTweeted: <a href="http://twitter.com/#!/brianpiero/status/15950268784975872http://twitter.com/#!/brianpiero/status/159502687... />senorpiero [at] yahoo [dot] comGFC Follower: Brian E.
...entered Eco-Friendly and Frugal - Zuvo Giveaway:senorpiero [at] yahoo [dot] comGFC Follower: Brian E.
Right now we drink unfiltered tap water and i'd love to try this. If it could improve the taste of our water it would be awesome.I am a GFC follower. i follow you via GFC and I'd love to have this because who doesn't need fresh water? Plus, it would make a wonderful gift for those that have EVERYTHING else.